U.S. President George W. Bush and Israeli Prime Minister Ehud Olmert both threw their support behind Palestinian President Mahmoud Abbas on Tuesday. U.S. President George W. Bush and Israeli Prime Minister Ehud Olmert both threw their supportbehind Palestinian President Mahmoud Abbas on Tuesday, with Bush praising Abbas as "a voice for moderation" and calling him the true "president of all the Palestinians." 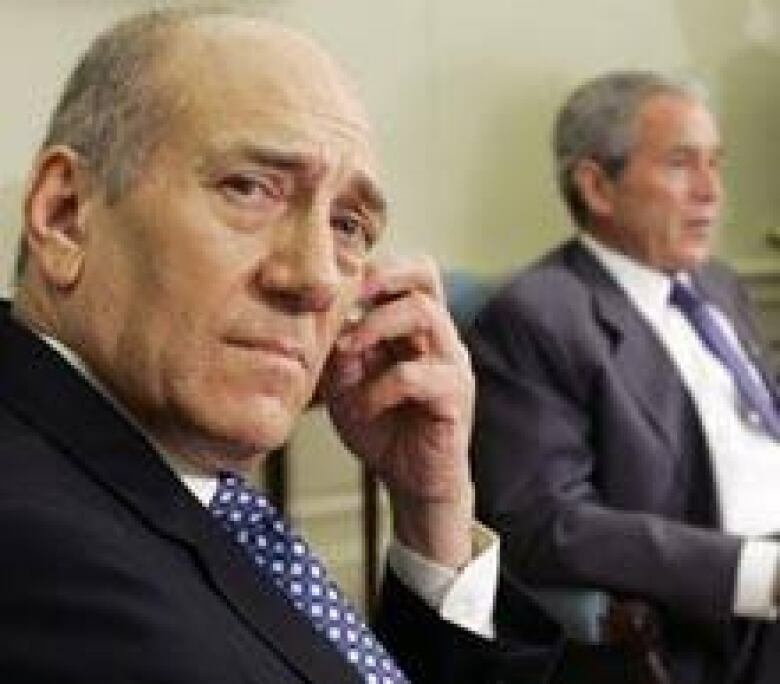 Bush and Olmert metin the Oval Office Tuesday in the aftermath of last week's violent schism in the Gaza Strip, during which the Islamist Hamas movement was able to wrest control of Gaza, leaving the Western-backed Abbas and his rival Fatah party in control of the West Bank. More than 100 Palestinians were killed in the conflict. "Our hope is that President Abbas and Prime Minister Salam Fayyad — who's a good fellow — will be strengthened to the point where they can lead the Palestinians in a different direction," Bush told reporters in the White House. Olmert vowed he would "make every possible effort to co-operate" with Abbas and also spoke positively of new meetings between Israelis and Abbas. He said the progress toward peace talks with Israel must begin with a more responsive Palestinian government and increased security efforts. The Bush administration maintains the divided Palestinian people can be brought together. Secretary of State Condoleezza Rice said the U.S. stands by a plan it laid out five years ago that has the Palestinian people united in one state and living in peace beside Israel. "We will be trying to press that case forward," Rice said Monday. "I think what you have seen is a clarification that there are those who completely reject that vision and those who are committed to that vision, and we intend to support those who are committed to that vision." Bush and Olmertmet on Tuesday to discussthe new political landscape in the Middle East. The meeting came a day after the U.S.and the European Union both ended year-long embargoes of economic aid to the Palestinian Authority asAbbas replaced the Hamas-led government with an emergency cabinet. The lifting of thesanctionsreleases $86 million to the Abbas government for essential services and infrastructure, and $40 million more will go to a United Nations agency that takes care of refugees in Gaza. Cristina Gallach,spokesperson for the EU foreign policy chief, said that although "we cannot work directly with the people of Hamas … we will definitely do the maximum effort to help the people in Gaza." The European bloc, like the U.S. and Israel, lists Hamas as a terrorist organization. Gallach added that the EU is channeling aid through the UN and wants to keep the Gaza Strip open so humanitarianworkers cancontinue delivering help. "We don't want Gaza to be closed, we want Gaza to be open, we want the people in Gaza to be receiving as much help as they need," Gallach told the CBC from Brussels. Canada has also promised to work with the new Palestinian government and is pledging more money in humanitarian aid. Also Tuesday, former Israeli prime minister Ehud Barak took over as defence minister after being elected last week to head the Labour party in a dramatic political comeback from his humiliatingelection defeat in 2001. The appointment of Barak, Israel's most decorated soldier,is sure tobolster the portfolio at a time of heightened security concerns on Israel's southern and northern borders. Baraktakes over from Amir Peretz, a former union chief with little military experience whose handling oflast year'sflawed Lebanon conflict has been widely criticized.